All of our special ones that have gone to the Rainbow Bridge. I believe with all my heart that this place exists and I know that my precious Max, Rocky, Kaja, Sunny, Maggie, Roxie, Teddy, Jody, Katie Bug, Allie Shoes, Lucy and Toby are the gatekeepers. All there, are in good paws!! All the animals who have been ill and old are restored to health and vigor; those who were hurt or maimed are made whole and strong again, just as we remember them in our dreams of days and times gone by. The animals are happy and content, except for one small thing: They each miss someone very special to them who had to be left behind. They all run and play together, but the day comes when one suddenly stops and looks into the distance. His bright eyes are intent; his eager body begins to quiver. Suddenly he begins to run from the group, flying over the green grass, his legs carrying him faster and faster. You have been spotted, and when you and your special friend meet, you cling together in joyous reunion, never to be parted again. The happy kisses rain upon your face, your hands again caress the beloved head, and you look once more into the trusting eyes of your pet, so long gone from your life but never absent from your heart. Then together you and your special pet cross the Rainbow Bridge…. There are hardly enough words to express what this special boy meant to me. The things that we experienced, the things that we accomplished together, the sheer joy he brought to my life and to the lives of so many others. Not only was he a American Grand Champion and International Champion, in 2014, he was the number one male shown in the Owner-Handled group and went on to take Best of Opposite at the National Owner-Handled championships. Every point he got was with me on the other end of his leash just being so very proud to walk into the ring with him. He loved for people to cheer him on and the louder they got the more he would show off. Yes, I laughed and cried with him on our last time in the ring, March 17, 2018, when he won the 10-12 year old veteran’s class. He was the most wonderful sire of over 98 pups and counting and I am so glad that my last two additions where his offspring. There is so much to tell about Toby, but the one story I have to share is the one that was called a Miracle. August 8, 2017 – not feeling well, labored breathing, not eating well, we went to the vet and then off to the emergency clinic for a ultrasound. The heart breaking news what that Toby had a 1.2 x .5 inch tumor in the right side of his heart and he was breeding into the pericardial sack. They tapped his heart and removed 300 mls of blood. The prognosis was very poor. Five days later, they drained another 300 mls of blood. With no western medicine available we went holistic. Over the next five months, Toby was totally normal. Doing any and all he liked to do and even sired a couple of litters. January, 2018, in for a ultrasound recheck to see if the tumor might have shrunk, only to learn that it was GONE!!! Yes, no evidence per the radiologist. It was a MIRACLE!!! It was Toby! All of life was grand until May 8, 2018…. Toby did not want to eat as it made him throw up. Back to the same radiologist and although his heart was perfect, his gastric wall had developed a mass throughout. Nothing helped this time and eight days later I had to let him go. He meant too much to me not to…. Sometime I wonder how I can find the words to continue writing about these special goldens, but then I realize I can write it because they are just that…Special!!! Lucy, LuLu, Lulee, Luboo, she was called by many endearing names and she never missed coming as there might just be a treat at the other end. Lucy was the greatest mom of all times having a total of 35 babies in her life. She just loved to be a mom and would have mothered all others litters if those mothers would have allowed it. She was a UKC (United Kennel Club) champion and would rather just walk around and check out nature and all the little critters than to do anything else. Well, other than having babies. To see her walk the perimeter of the property checking out every little spot just in case something had been there is something that I treasured and miss every day. She would always be the last one pulling up the rear on our walks, but I also always knew where she was…coming! “Come on Lulee” was something that I said daily, and then she would pick up the pace. Before you knew it, there she would be. When Allie died, Jessie ( Allie’s daughter) took over her place of wrestling with Lucy. They would chase and have so much fun…I miss that so much. In May, 2016, Lucy had been slowing down. She loved her napping, but she didn’t want to run out to the barn any longer. While rubbing her I felt a tumor near her abdomen the size of my palm. Within seventeen days the tumor/s had grown to the size of a bowling ball and she was starting to labor. It was time to say a very tearful good bye. I miss you Lucy, I hope your having fun with Bobby, Allie and all the others. Kiss them for me and give them your paw that I miss holding every night. This loss is so hard to write about and the hole that she left is huge. Allie was such a big presence. It has taken me months just to be able to do it. The loss was just too sudden and so unexpected. We are never prepared. If there was ever a dog that I thought would live forever…it would have been Allie. She was our agility girl. She loved it and was great at it when she wanted to be. She had her jumpers title and was just one leg shy of her standard title, but when she just didn’t want to do it any more, I would not make her. She was hilarious too. She had this way of talking to you and boy if you weren’t getting their dinner ready close to 4 PM, she would come find you and tell you, “IT’s TIME!” She knew exactly when it was almost 4. We affectionately called her “Shoes”, or “Allie Shoes” as she always was carrying someone shoes around. Never did chew one of them, but loved carrying them and making her loud callout as if to announce, look what I have in my mouth. She was just so funny, she and Lucy, her younger sister were inseparable. They would wrestle every day with mouths open and flipped on their backs. It was so funny. She was a mother to many, but her most special was Jessie, the one that never left. One night in August, I was getting her up to go to bed. She could sleep so soundly. When I finally got her moving, I noticed a small limp, so I rubbed and rubbed her legs to wake her up, then my hands moved to her shoulders and my right hand stopped when I felt a hard swelling on her shoulder blade that had not been there before. I remember thinking she had played so hard that day, she must have injured her shoulder in one of her chases. Three days later, even with icing it, the swelling had not subsided so off to the vet we went. The needle aspiration was not encouraging, so we went for a biopsy and days later were told that Allie had Osteosarcoma in her right shoulder blade. She was in great health and the surgeon said she could easily live 8-12 months and we could manage any pain that might come. They also found that she had a mild heart arrhythmia, that had come on later in life. They weren’t worried about it either. Two days later, after being so very normal, excited about food and just generally being her normal self. Bobby put her food down, walked to feed the others, and within a minute walked back and she was gone. He screamed for me, and I found her laying peacefully on her side as if sleeping. There are no words for the shock, the loss. I never got to tell her good bye and that is what hurts the most. We still miss her every day as she is everywhere and Jessie has taken over her place in wrestling with Lucy every morning. We love your Allie Shoes and miss you so very much. Katie Bug what a grand girl she was. A fantastic mother, a talker and one that would play tennis ball for hours on end. She was so much like her Mama Maggie that I would occasionally look at her and tell her just that. She had this way of making you mad and to laugh in the same moment. She could be bad and yet so utterly sweet that you could never really get mad at her. She just had that look. A quiet leader of the pack until she got really older. She would teach the young ones the boundaries and if they didn’t listen she would make sure they got her message. Her correction was worth a thousand of mine and every pup learned from her. That was the mother in her. She was tough too! She came through mammary gland cancer and proved everyone wrong, it was not going to get her. She lived to be loved and to chase a tennis ball and my greatest joy was to see her chase those balls in our new big yard. I had so worried she would not live to enjoy the new acreage, but she did and for the first time in my life watching them all run I felt pure joy. She had made it and I so loved her. April 8, 2014 – today at 4:47 PM, I made that awful decision to let my old Katie Bug go. I had held her in my hands the moment she was born and been blessed to kiss on her every day of her life until today when I gave her that final kiss and hug and told her how much I loved her. I then told her to go to her Mama Maggie and Daddy Teddy and to tell them how much I miss them and that she is now with them once again. This picture was taken just hours before I let her go. Katie had been so strong, so tough her whole life. She loved to play tennis ball and would wear you out with that game of, “here, you take it….NO…I’ll take it back!” That would go on for hours and then to chase and catch that ball in the air, time and time again. It was just everything to her. 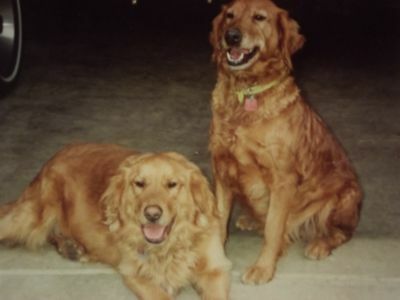 She was a wonderful mother, bringing many wonderful golden pups into this world with one special male, named Jack Boy. They completed so many families and still do to this day with their offspring. In December, 2012, a lump was discovered in her mammary gland and it would come back as an agressive form of cancer, but obviously Katie was not going to let that stop her and it never did. Although getting older, I witnessed for the first time, pure joy on her face along with the others when we moved to a new home with five acres to run. She was wanting to chase the tennis ball again. She was going to prove those lab results wrong and she did. In February, 2014, Katie had a seizure. It didn’t last long, but it was like seeing her daddy Teddy all over again as he had the very same seizures in the months before I lost him. It scared me with what her future might hold, yet again she never had another seizure, but neurological issues started to happen. First she lost her hearing and then months later her eye sight seem to go, yet she still knew when it was time to eat and never missed meeting me at the food bins to help to me serve everyone. Who knew, one piece might hit the floor and if it did, Katie would get it. As the weeks and days went on, other neurological issues started to show and it was evident that Katie’s grand quality of life was being diminished. With a very heavy heart and many tears I sent her to the Rainbow Bridge to be with her Mama Maggie and Daddy Teddy once again. Sweet dreams my precious girl. I will see you every day as I walk the yard, thinking you are walking behind me as you always did. I love you Katie Bug! 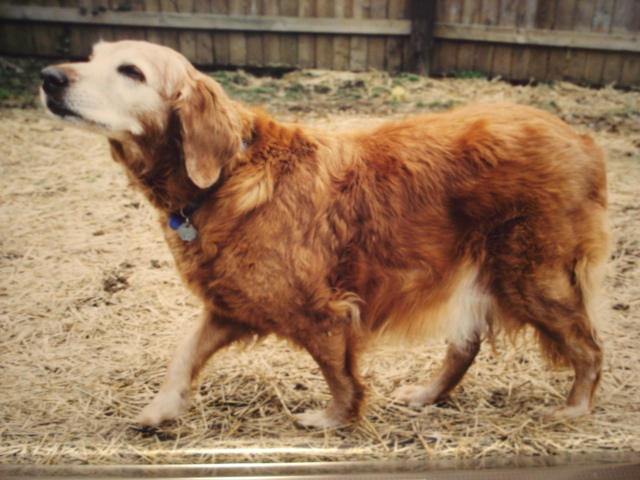 Teddy joined his Mama Roxie and sister Jody on April 21, 2011, just 15 days shy of his 14th birthday. 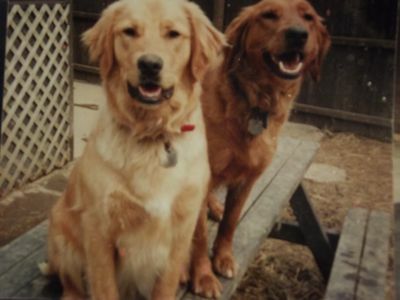 This is Teddy and Jody one of the last times they were together. They are so very missed. 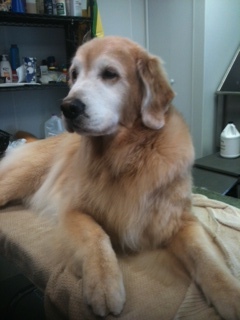 Teddy was a gentleman and a wonderful velcro dog. He always wanted to be wherever you were. If you moved, he would move too. From room to room, place to place, it didn’t matter if he was sleeping or not, he knew when you moved. He was my first show male and we had some grand times in the show ring. Being so tall, it was easy for me to show him and he really liked it. He would strut his stuff and when we won a ribbon, he would wear it on his collar like a diamond necklace. He was the proud sire to 27 pups and the grandsire to 25 all from his daugher Katie. He was a pretty boy and was loved by everyone that met him. Even at 13 years he walked with us daily, slowly tapering down from three to six miles a day down to a good mile or more daily. Even on his last day with me we walked our mile and he loved every minute of it, as did I. Teddy is very missed, as he was a grand presence in our home and hearts. To think that he is playing and chasing at the Rainbow Bridge helps me to smile. He loved to chase the girls! I miss you sweet Teddy Bear, my big boy, my Swappa Bear. The mother of 28 and the grandmother to many more, Jody was an awesome mom. She was special because she got to be loved by two families the last three years of her life. After my friend Tricia lost her beloved Cheyenne, she asked if she could “borrow” Jody. After some time I asked Jody one day, “where would you rather be, here and one of seven, or with Tricia and Roger and be one of one?” She ran to the door so fast, she didn’t have to answer, I knew what she wanted. She came back to visit and stay many times, but her heart always belonged to Tricia who loved on her 24/7. She went on vacations to Michigan, played in the lake, flew in a private plane, and so much more…she lived a fantastic life and for that I am grateful. On September 11, she was diagnosed with an enlarged heart which was the start of what we believe was a form of cancer. She lived three months with Tricia’s undying love and devotion and I was so lucky to have her here for her last night to be loved on by many. Jody went to the bridge on December 12, and she is sorely missed by us all. She was 12 1/2. Until we meet again…I love you LoLo. 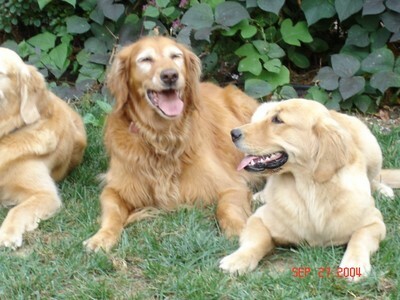 She was the mother, grandmother and great-grandmother of my entire Goldenstar Goldens clan. 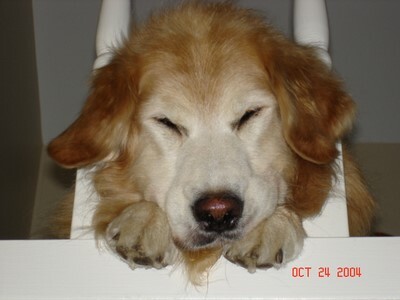 She was my girl, my shadow and my velcro dog…she will always be my Grand Dam! Thank you to Sue McGavic for giving me my first show golden and fulfilling my dreams. This picture was taken at 13 1/2 years of age and still going strong! Also known as Roxanna Danna and her kids the Danna Clan. Today at 4:28, my precious Roxie went to the Rainbow Bridge to be with all of her friends and family that have gone before her. My eyes hurt and my heart is breaking for the loss of my first show dog, my shadow, my velcro dog, my heart dog. Roxie had surgery in November to remove a tumor from her neck, but it was found to be more that than. The prognosis then was maybe days, but Roxie being the strong willed girl she is, she wrote her own book and took it not only to her 14th birthday plus five more weeks but to 13 weeks total post surgery. The vets were constantly amazed with her progress and just getting that nasty incision to heal was a major feat, but not for Roxie. She wore her stylish turtleneck wrap and even sported it with her Christmas bandana covering it for her annual picture with Santa in December. Not until the last few days had Roxie ever let on that her days were numbered. I couldn’t help but call her the miracle dog when at 14+, deaf, and with arthritis in one leg, she was still able to walk down the street and pull me most of the way. I could not move without her being just steps behind me. She had to touch, and no matter how asleep if you moved she would move with you. She was the ultimate velcro dog. I know how fortunate I have been to have shared her life for 14+ years. She gave me many others to love through her children and grandkids and now even great-grandkids, plus the endless families that joined my Goldenstar family when they got one her those kids. For all of those I am eternally thankful and my only wish is that each of them get to enjoy the long, happy life that she was so fortunate to have and she allowed me to share in. 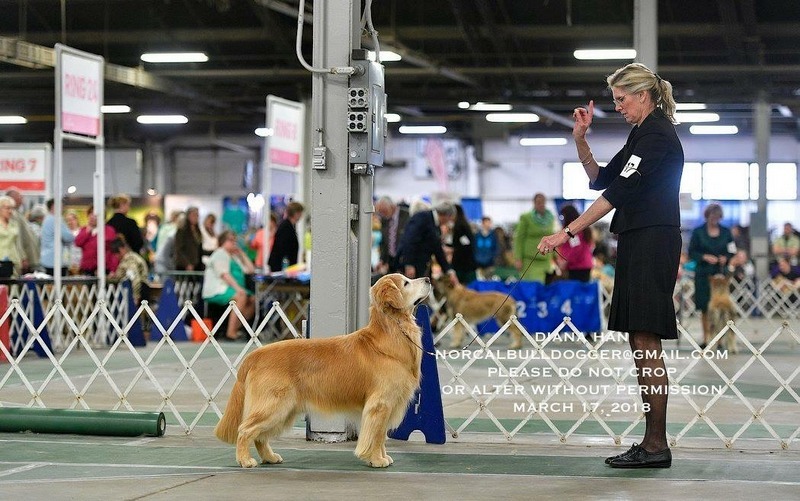 Sue, thank you for letting me bring Roxie into my life, my home and my world and for giving me my very first show golden. She opened up a whole new world for me and to this day I still love it and I still remember my first time in the ring with her. I was the nervous one, she was the one with the confidence. Roxie was the last survivor of her litter losing her sister Lily only five days after they shared their 14th birthday. Roxie will live on in not only her kids and grandkid, but through her donation of blood and tumor tissue to the Dogdna.org, Broad Institute of MIT and Harvard at Cambridge Gene Mapping study of cancers in dogs. My hope is that with this small contribution, maybe, just maybe, it will help make strides in finding that elusive cause for not only cancer in our beloved dogs but also in humans. Godspeed my precious one from all of us that loved you so very much and thank you all for caring. Oh my precious Maggie. This was one of her favorite spots to lay and she would squint those eyes as if to say, “Are you talking to me?”, when she knew I was calling her name. She was my consumate mother. She would take care of her pups and then if there were others, she’d go feed them too. She was also known to lay and lick the others face as if it was the best massage ever. She was the first to catch a bird. Snatched it right off the bird bath. That bird never knew she had crept up. 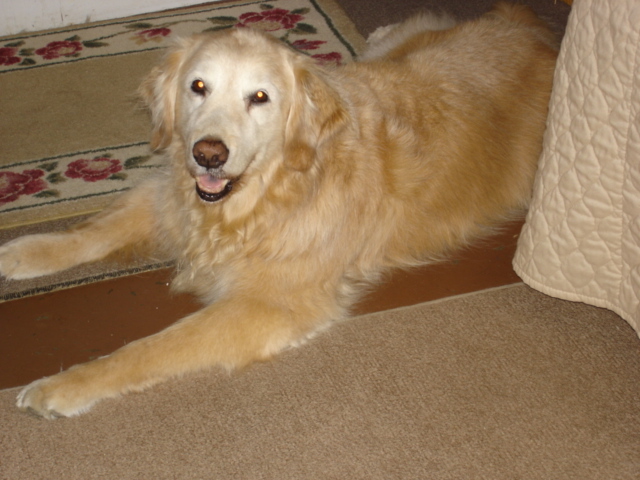 In August, 2004, Maggie was dianosed with Lymphoma. She had 10 wonderful months after that while on chemo, never having an ill effect. I can’t tell you the times I still see her laying on the landing with her head sticking through the pickets. Maggie was also known as Maggie T Chick a Pee, and we called her Chick! Sunny was affectionately call Big Girl. She was always rather thin, but she was tall. She definitely took after her father’s side. Sunny was our first real running partner. If she saw running shoes, she was ready to go. Didn’t matter how far or for how long, she just loved to run. She ran many races with Bobby and myself, but her claim to fame was the run that she pulled Bobby all the way to first place in his age group. When they called him for his award, they announced, “Sunny Miller”…if it hadn’t been for her, he might not have finished so fast. 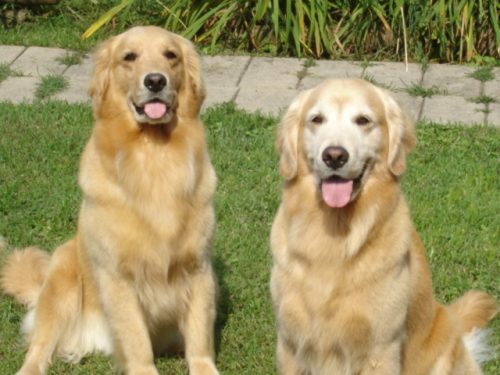 It’s late Sunday evening, I can’t sleep, but I wanted to share my sad news with all of you that understand my love of my goldens. I lost my oldest girl Sunny today. Since April when she was diagnosed with Megaesophagus which had developed into aspirated pneumonia, and found to have tumors on both of her adrenal glands, we have fought to keep food down, and to keep her quality of life to the high standards she always deserved. She had done really well for the most part doing all the things she loved to do when she wanted to do them. Although at almost 14 years of age (in September), she still loved to take walks and even chase a tennis ball on occasion. She was affectionately known as our Ol’ Big Girl. Last weekend after many nights of not much sleep she developed a severe infection, with a high fever and terrible vomiting. When I got her to the vet, they deemed she was a strong old girl and could use some medicines to help with the fight. I actually thought it was so bad that I would have to let her go. But once again she rallied from all the fluids and injections to take walks and eat like a horse. With the great care Pat and Tricia gave her during the week, she did great until very early this morning. I was keeping her in the kitchen so as not to worry about her falling on the steps, etc, and she barked at about 1:30 AM to go out. She wouldn’t come back in, so I put the fan on her and let her rest outside on her pillows. Seemed OK, yet it wasn’t but a few hours later when I came back to check on her that I noticed she had been throwing up in many places and I didn’t like what I was seeing. After taking her temp and seeing how high it was (103.4), I got her iced down, and got the temp down to a good place. In the next few hours I watched as she slowly went down and got sicker. I can tell you, that you always know in your heart, even though all the tears, when it’s time to let go. We kept her comfortable in the cool basement until I could reach my vet. At 2:15 today, I let her go, no fight left, and totally peaceful. The vet, her assistant and myself all crying tons of tears. I know she is now with her Mama Kaja, along with Rocky, Max and Maggie and that she is happy and healthy again running in the fields at the Rainbow Bridge. I told her we would meet again and we would run just like we use to do when she was young. Thanks for letting me share this with you all. 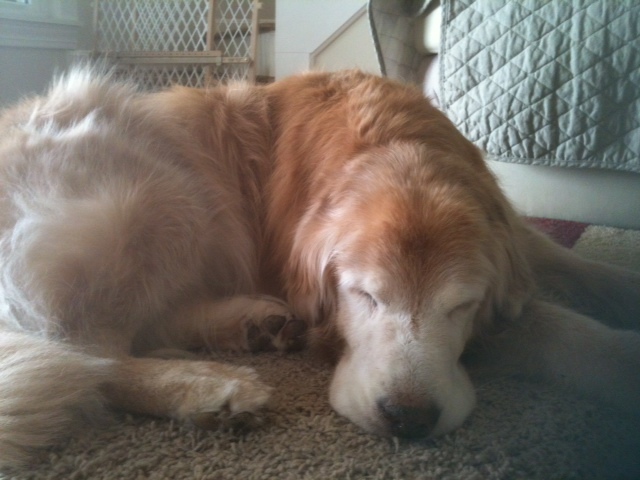 I am so very sad, but I know I did the right thing for my Ol’ Big Girl Sunny Shine. Kaja at close to 15 years of age and still looking like a beautiful old girl. She was my first golden and is the reason that my love for goldens grew every day. She was so funny and so loving and animated when she knew you wanted her to do something she didn’t want to do. She had this dance that she did which could never be copied and it always made me laugh. What a grand old girl she was. Max was my first dog when I got my first house. 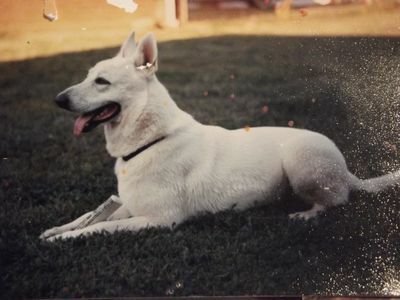 My brother, Bill had gotten this beautiful white German Shepherd that he named Nike. He brought him by my house to show me, and I fell in love with him. He told me the breeders had one male left that they were holding for me. I got Max that very day. He not only ran with me, he was my protector and when he was with me, I was never alone. 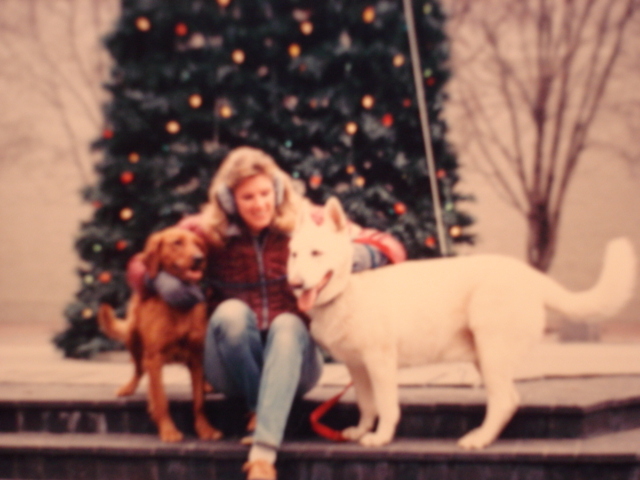 At 100 pounds, and solid white, he was a magnificant dog. I sometimes think he died of a broken heart as he died 6 months after I lost his best friend Rocky. Oh, how he lived up to his name, the WILD part that is. We lovingly called him Destructo Monster, as Rocky could chew through and dig under anything. Once chewing through all the lattis on the screened-in porch and then chewing through the screen just to get inside. Then he decided I needed a tunnel under the dog house and then under the fence, so he dug it. That tunnel must have been 10 feet long and around 3 foot wide. Nothing could hold him, nothing! Yet his life was so short and I loved him so very much. He was one of Kaja’s first pups and he was very special. When he was only 5 1/2 he was diagnosed with Lymphoma and given 6 weeks to live. Rocky lived 13 weeks and I know he did that because he did not want to leave me. To let him go was the hardest thing I ever had to do. Yet he taught me that to let them go was a gift only we could give them.